The official theme of Black History Month 2019, “Black Migrations”. The month-long event celebrates important black figures and moments in history. Originally created in 1926 by Carter G. Woodson, he chose the second week of February as a way to highlight the birthdays of Frederick Douglass (Feb. 14) and Abraham Lincoln (Feb. 12). The week turned into a month-long national observance in the U.S. in 1976. “Black Migrations” is focusing on the movement of people of African descent to new destinations and subsequently to new social realities. This year’s theme highlights migration of Blacks in from the early decades of the 20th century when African-American migration patterns included relocation from farms to cities. “In the migration’s early years, 500 people a day fled to the North. By 1930, a tenth of the country’s black population had relocated. When it ended, nearly half lived outside the South”. (From the James Earl Jones Collection). One of the most prominent examples of Black movement is the Great Migration that occurred between 1916 and 1970 in which 6 million African-Americans moved out of the rural Southern United States to the urban Northeast, Midwest, and West. For example in the Northeast, Harlem drew nearly 175,000 African Americans making it the largest concentration of black people in the world during the Great Migration. Chicago and Northern Illinois was known as the “Promised Land” a prime destination for blacks living below the Mason Dixon line. It is reported almost 500,000 blacks moved to the city in the first wave of migration between 1915 and 1940. It was the greatest migration in U.S. history. And when millions of African Americans fled the South in search of a better life, they remade the nation in ways that are still being felt today. That “Promised Land” the greatest migration in U.S. history, was for those who dared to dream bigger than their front yard, who perhaps dared to say, ‘I can and will do better than this,’ even while they could see nothing beyond their own immediate community. This is their legacy, this is their story. For a complete immersive look and the Great Migration see, “THE ROAD TO FREEDOM” By Isabel Wilkerson. This story was published as a special issue of the Smithsonian Magazine. 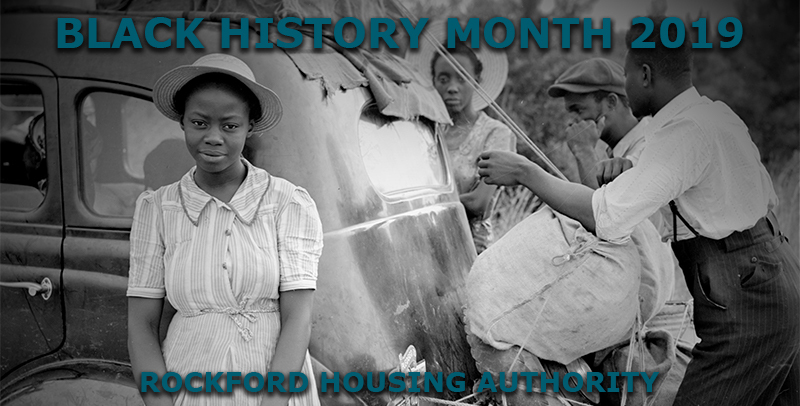 Rockford Housing Authority has been working for the community for over 67 years, providing housing and services for all people in our community in need. We have gotten to know and experience the community and its needs. Affordable Housing provides a gateway to opportunities and choices that help children, families and adults improve their quality of life through education, counseling, training, and employment. Our continued vision is to help each person, no matter what challenges one faces, to achieve success and thereby enrich not only one’s life, but also the community in which we all live, work and raise our families.